Mario Lemieux's hockey resume speaks for itself. So imagine his surprise when a fellow dad questioned his credentials. When Lemieux was coaching his son Austin's peewee youth hockey team in 2010, a father of one of the players had a suggestion. Pittsburgh Penguins team president David Morehouse was there to witness it. "We were at a game when [Mario] showed me [the email]," Morehouse said. "It was when BlackBerries were still popular. He showed me an email on his BlackBerry from a parent, and it said, 'I'm really concerned about the power play, and I have some suggestions on how to fix the power play.' Mario showed it to me, and we both just started laughing." Lemieux played 915 career regular-season games in the NHL and scored 690 goals, including 236 on the power play. To top it off, he's a Hall of Famer and owns the reigning Cup-champion Penguins. But being an elite athlete doesn't necessarily make someone a good coach. There are plenty of examples of former pros who tried to coach but couldn't -- at any level. But challenging Lemieux's knowledge of the game? That's ridiculous. But it's an example of what many youth coaches -- even former pros -- sometimes deal with when they leave the game and step behind the bench of minor or youth hockey teams. "If someone is willing to tell Mario Lemieux, who is in the top five players to ever play in the National Hockey League -- how to run a power play, then anyone is open to criticism," said former NHL goalie Brian Boucher, who coaches his son Ty's bantam team. "Parents are unbelievable." A number of former NHLers coach youth hockey simply for the love of the game and to develop young people and athletes. But dealing with overzealous parents can be enough to run any coach, former player or not, from the game -- unless they set clear ground rules. 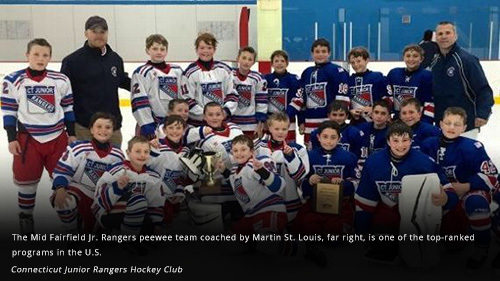 Martin St. Louis -- a future Hall of Famer who retired after the 2014-15 season, won a Stanley Cup with the Tampa Bay Lightning in 2004 and recorded 1,033 points in 1,134 NHL games -- now coaches his sons, Ryan, Lucas and Mason with the Mid Fairfield Junior Rangers of Connecticut. "I tell the parents, 'I'm going to coach like I parent, and if you don't like my parental skills, you're probably not going to like me as a coach,'" said St. Louis, who runs weekday practices, coaches games on weekends and travels with his son's teams. "I'm here to (1) Make good people, and (2) Make good hockey players. In that order. Usually, good people will become good at something if they're passionate about it because the good people will hold themselves accountable and they'll do the right thing to get better." An undrafted 5-foot-8 right winger out of the University of Vermont, St. Louis went on to score 391 goals with the Calgary Flames, Tampa Bay Lightning and New York Rangers. He was also a six-time All-Star and twice played for Team Canada in the Olympics. "I find that, with my background, parents have trust in what I'm doing with their child," he said. "I like to win, but this isn't about winning. This is about developing the kids, and I truly believe that. I find the toughest thing to do as a youth hockey coach is come tryouts time, when you have to cut kids. I don't enjoy that at all." St. Louis is around the rink more now than when he played. He travels just as much too. And he often runs into other former players at games all over North America. "It's really cool to see how many NHL guys are at youth tournaments and how many guys are still involved with the game," said Boucher, an assistant with Team Virtua of the Atlantic Youth Hockey League. "When I was a kid, we didn't have any NHL players around us coaching our program. It's a great thing that a lot of these guys give back and coach. I really do enjoy coaching and being on the ice with all the kids." Even though their playing days are done, the pro guys are still competitive. Boucher was quick to point out his team's 2-1 record against St. Louis' Mid Fairfield Rangers this season. "Did Marty tell you that?" he asked, joking. "The glory days are over for us. Marty obviously had a fantastic career -- much better than mine -- but he and I share the same passion in a sense that we really enjoy watching our kids play now. The common thread is we probably enjoy watching our kids play now more than we enjoyed playing in the end." As much as they still want to win, developing young athletes is first and foremost for these hockey dads. "We balance the wanting to win at all costs, because you've lived it, but you have to realize they're kids," he said. "It can be tough." A number of other former NHLers also coach youth teams, including Glen Murray, Mike Grier, Ben Eager, Daniel Carcillo (can imagine someone with a nickname "Car Bomb" coaching your kid? ), Chris Dingman, Vinny Prospal, John Tucker, Jassen Cullimore, Pat Peake, Adam Foote, Stu Grimson, Eric Nickulas, Ryan Smyth, Marc Savard, Radek Dvorak, Petr Sykora and Kris Draper. Many of them will admit that they're harder on their own kids than other players, and that toeing the line between being a coach and a dad can be tough. "It is a balance, and you have to find it," St. Louis said. "My three boys are all different, and I coach them differently. At the rink, they know I'm coach, and at home, obviously, I'm Dad. I'm going to hold them accountable just like everybody else. Sometimes I'm probably a little harder on them than anybody else. It's a challenge." In order to become -- and remain -- a USA Hockey certified coach, one must complete a program that consists of learning modules, tests, seminars, on-ice training, SafeSport and a background check each year. "I passed them all," St. Louis said with a laugh -- then noted how helpful the training has been, even for a hockey lifer. "Just because you had a good career as a player, it's not automatic you're going to be a good coach, especially when it comes to dealing with different age groups. I've learned a lot from the modules USA Hockey put together. I'm more prepared to deal with the age groups that I'm dealing with after watching these videos, no doubt." For St. Louis, coaching has provided a chance to stay close to the sport -- and their kids. "People ask me if I miss the game, and I say, 'No. I don't miss the game at all.' I'm probably more involved, and I'm on the ice more now than I was before," St. Louis said. "It's a lot of fun to be able to help your own kids. They're avid, passionate hockey players, and it allows me to help them in something they have a passion for." But sometimes that passion can boil over. Nearly every coach has a story about parents who get too invested in their kids' success and lose perspective, or expect unreasonable returns on the considerable investment of time and money they're making to allow their child to play a travel sport. "The problem with youth hockey is that you have these coaches trying to implement things, and a lot of stuff can get undone by the parents in two minutes on the car ride home," St. Louis said. "It's so important to just let your child go have fun and put the trust in the coaches. If parents are pulling on one side and the coaches are pulling on the other side, you're stalling your kid's development. Seeing parents directing traffic from the stands is tough to watch." Calgary Flames president Brian Burke once said that unless he brought it up, his father would never talk about a game after it was over. St. Louis has taken a similar, but slightly different approach, with his sons. "By the time the kids go to bed, they're far removed from the game and have had all day to digest it," he said. "So, right before bed you can have that one-on-one moment with your child to discuss things. "It's impossible to play a perfect game," he continued. "There wasn't one game in my life, especially as a professional, that I wouldn't like to have three or four plays back. Every game you want plays back. Hockey is a fast game and it's a game of mistakes. If [a child] is getting nitpicked nonstop, they're going to hate the game." So St. Louis tries to draw from his own experience as an an undersized, undrafted forward who was pegged as a fourth-line forward, but outworked everyone to reach the pinnacle of his sport. "For me, it's all about work. If you're going to work, I don't care what the result is," he said. "The harder I worked, the luckier I got. The kids are going to make mistakes, and you want them to make mistakes. I'll never sit a kid for making mistakes. If a kid's not working, we'll talk about it and maybe he'll skip a shift. You can control work. But you don't bench a kid for making a mistake." Like St. Louis, Boucher has found a passion and a post-career calling in coaching. "Coaching kids and making a difference in their lives means a great deal to me," Boucher said.